I’ve been saving up my paper rolls in hopes of making something with them. I decided to make these little ornaments after folding, bending, cutting and just messing around with the rolls. My little guy helped me out. 1. 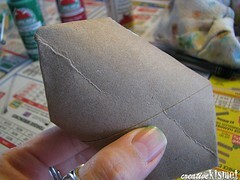 Fold paper roll as seen in first image. 2. Match points up and press together. 3. Repeat on other end. 5. Decorate. 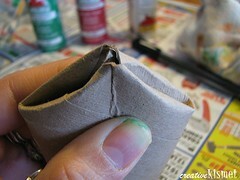 You can paint something directly onto the roll or glue images from books, fabric, wrapping paper, etc. Use small drawings that the kids have done on paper and glue them on, or a photo would work great too. Add a little glitter or stickers. Sky’s the limit. 6. Give a light coat of satin varnish (optional). 6. 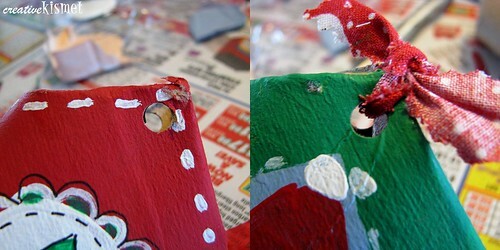 Punch holes into each point and tie together with twine, ribbon, strips of fabric or yarn. Repeat on other end. 7. 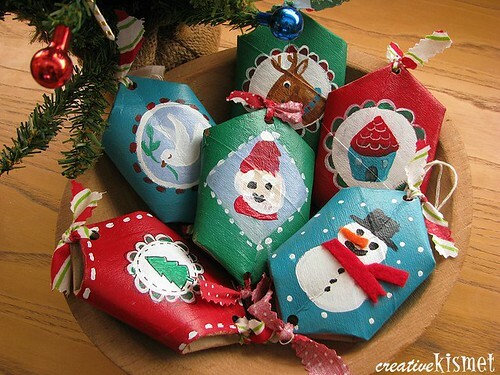 Add another string for hanging on your tree OR use as gift packaging for a small treasure (jewelry, small toy, money). 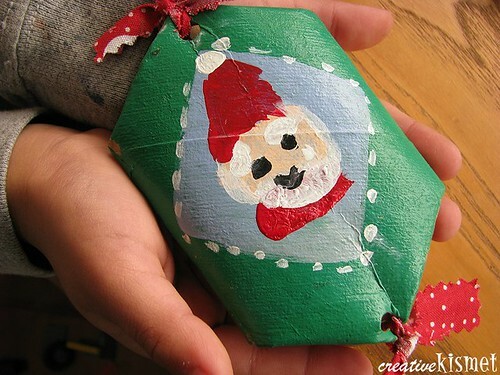 Wrap the small gift in tissue paper and stuff inside. Use a long piece of ribbon that you can tie the bottom ends together in a bow so it can easily be re-opened for a surprise inside. 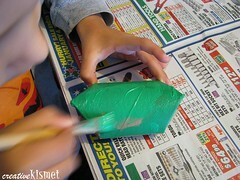 This entry was posted in Fun kid stuff, Holiday Hoopla, Recycle,Reduce,Reuse, Tutorials, how to. Bookmark the permalink. i was in need of a great idea like this! I love these! So creative! Oh, they’re great! I *love* the idea of using them as gift boxes! 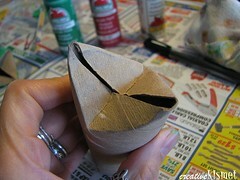 I have a toilet paper roll project that I want to blog about (someday! ), too… wow, I don’t think I can ever just throw one in the recycle bin again. 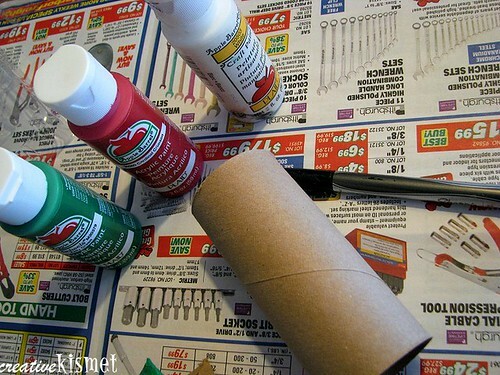 I always have a secret stash of empty paper towel rolls and empty cans for crafting! Great idea! Those are so cute. I love it. i always want to save my rolls but they end up in the recycle bin. This is a great idea and so much fun. These are SO cool!!! Love em! Oh my goodness! The ornaments are way cute, what a great idea!!! Blessings on you and yours this holiday season! I love these! They would also make good gift holders for smaller presents. your ornaments are so clever and cute! i found you from leah’s blog and your crafts are a delight! Oh I just did these!! They were so fun!! Thanks for the great tut! Those are so cute and super creative! I never would have guessed their origin. Thanks so much for this, I’ll be linking. lovely ideas! I also made some eco-packaging as I call it. Wanna see? Look here: http://bom-feeling.blogspot.com/search?q=eco-embalagem. Did you know your craft is here in Spanish? Just FYI, she has lots of other’s crafts, and though she links I don’t know if it’s fine the fact that she may not have told you she took it for her own profit. 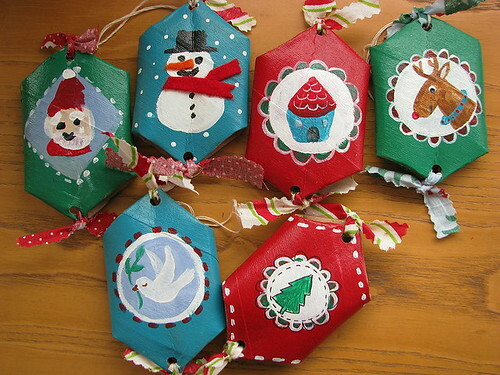 These are beautiful hand crafted ornaments, and what a great “how to” guide! 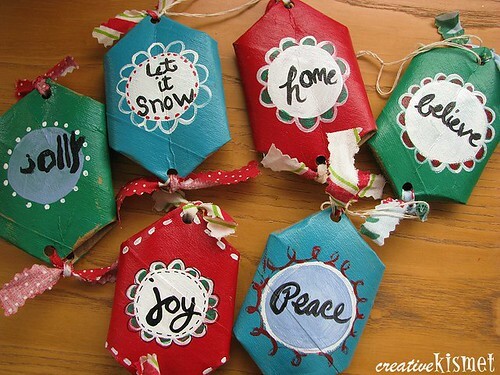 Our family is definitely going to try making these this year, my favorite is the Let It Snow ornament. I made these for my son’s birthday,filled them with candy and passed them out as party favors. It was a lot of fun to make and the I was incredibly pleased with the finished product. I plan on making more and hanging it on our x-mas tree, in lieu of a stand alone advent calendar. My boys can pull one each day and open for a sweet treat. Thanks again. These are great. Sorry I found them after Christmas. Maybe they will work for Valentines Day.